Rohloff Axle Plate bolts sheared. Gary, I'm currently travelling and back home Wednesday afternoon. Best to call then as I'm in and out of range whilst travelling. 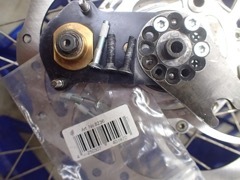 Replacing the end cover will not rectify this as the sheared off screws are in the main internal gear unit. You will need to send the wheel to us to remove and repair this one. And yes, you need the 5 screws to properly hold the axle plate in place and possibly a new axle plate - although my concern would be more the holes have elongated slightly due to the movement of loose screws which can cause damage. It is very important the axle plate is held securely in place, otherwise you will continue to have issues and cause further damage. I'm a little baffled how they sheared? Normally if someone overtightens they shear at the head. Are those 2 screws Rohloff screws.... as they look different in colour? 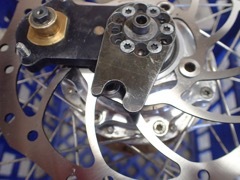 I have finally fitted the Magura MT7 brakes to the rear of our Ventana MTB tandem. They go great and we have been enjoying more single track riding of late. The fitting involved fitting the new 180mm Magura Storm Rotor and monkey bone therefore I had to remove the OEM axle plate. All the retaining screws were loose and when I removed them some of them were slightly bent about 5mm from the end and worse still 2 of them were only ~20mm long so they were not picking up any thread when reinserted. Obviously the OEM axle plate had to be rotated to a new position to fit the Monkeybone I bought from you way back in mid February. I used new screws for the 3 that still could be tightened but the other 2 are just sitting in the holes. I am concerned that with only 3 screws then things may fail but I am also concerned that it may not be possible to remove the 5mm of bolt that has sheered in the bottom of these 2 holes. Do you think it would be possible to remove the 5mm of screw,bolt from these 2 holes so full length bolts can be used? Alternatively maybe I have to get a whole new left side disc brake cover plate, which I assume would be relatively easy for me to fit. If this is your recommendation can you give me a price for the parts required? Another concern is the slight damage to the axle plate that is visible in the photo below where the slot in the axle plate has been slightly deformed on the left side of the photo. To save you giving a long reply I will give you a ring sometime next week to discuss this now that you have seen the photos and had time to consider the best options.